EXETER – Jaykob Acosta is one of the reasons the Monarchs have had so much success in recent years. As of late he has led Exeter back into CSL contention. 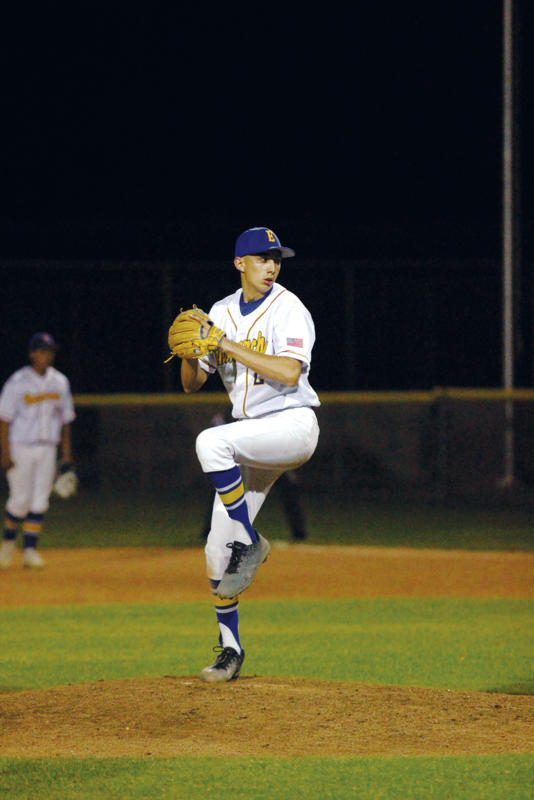 Part of his effort came last Friday when he pitched a 2-0 shutout over the Kingsburg Vikings at home. Exeter’s (10-4, 3-2) ace kept the Kingsburg (5-11, 2-3) batters guessing with a variety of fastballs and off-speed pitches. He struck out 12 on his way to capturing his first Central Sequoia League win this season. Although, it may seem like just another night on the mound for Acosta he did have to get out of a couple jams in the second and third innings. In both innings Kingsburg got baserunners on second and third with only one out. It seemed as if the 1-0 lead Exeter had was going to vanish, but Acosta struck out the last two to end the inning. “Acosta mixed up his pitches and threw well tonight,” Exeter head coach Kevin Kirkman said. Acosta contributed at the plate as well. He went 1-3 and drove in the winning run in the bottom of the first inning. Exeter then added an insurance run in the bottom of the third when Jaycob Aurelio, who led off the inning with a double to right, scored on a ground out by Sal Briones. Even Exeter’s defense, which has had its ups and downs this season, played their best game yet. Exeter only committed one error and turned the only double play of the game in the top of the fourth. The biggest move was the switch of Aurelio from second base to shortstop. However, junior infielder had three assists in outs during Exeter’s win. Exeter wrapped-up the first round of CSL play Monday night on the road against the Dinuba Emperors. Results were reached after press time. Dinuba was coming off a 2-0 loss to the Central Valley Christian Cavaliers. Against the same opponent, Exeter defeated CVC 17-3. The drastic difference in the two scrores proves that the CSL is as close in competition as it has been in recent years and that goes for the Monarchs as well. Exeter’s two losses are to the first place Selma Bears 2-0, and second place Immanuel Eagles 9-6. Both outcomes were so close they needed a combined total six extra innings to be decided. In Exeter’s loss to Immanuel, they committed nine errors and still had a chance to win the game. Now that Exeter seems to have put their mistakes behind them, they will try and turn those losses into wins.